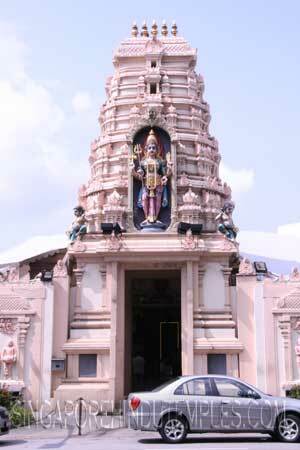 Sri Vairavimada Kaliamman Temple,one of Singapore's oldest temple in existence, was Originally erected at Killiney Road,before being relocated two more times before finally moving to Toa Payoh. The original temple structure at Killiney Road was in the path of a proposed railway line which was to run from Tank Road to the Causeway in Woodlands. after much negotiation, the railway authorities bought over the temple's land. Trustees of the temple then erected a new structure on vacant land at Orchard Road. Unfortunately, the Railway authorities once again acquired land owned by the temple and it had to be relocated for the second time. Then a new piece of land at 21 Somerset Road was purchased for building the temple in 1921.it was constructed by the then Mohammedan and Hindu Endowments Roads in 1933. Then in September 1970, all 8,854 sq. ft. of land at the temple's Somerset Road location was acquired for development purposes by the government.